1Institute for Sustainable Agro-Ecosystem Services (ISAS), Graduate School of Agricultural and Life Sciences, The University of Tokyo, Nishitokyo, Japan; 2Experimental Farm, Faculty of Agriculture, Yamaguchi University, Yamaguchi, Japan. Copyright © 2013 Nobuhito Sekiya, Hideki Araki. This is an open access article distributed under the Creative Commons Attribution License, which permits unrestricted use, distribution, and reproduction in any medium, provided the original work is properly cited. 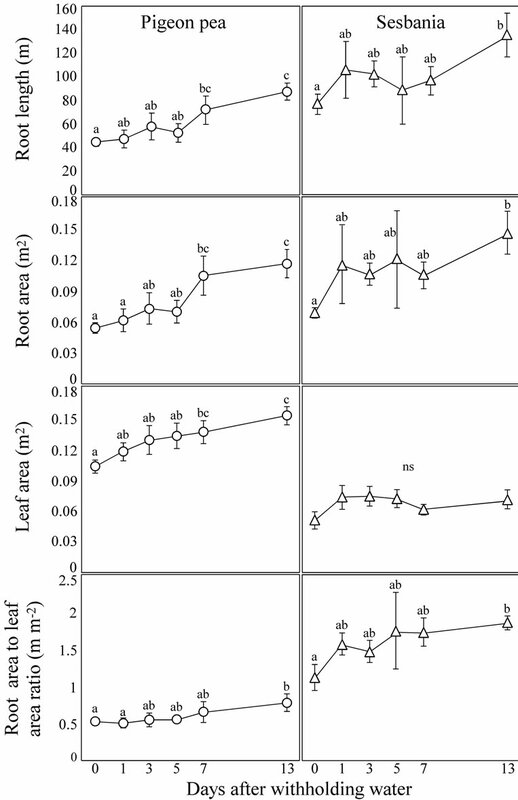 Responses of leaf area (LA), stomatal conductance (gs), root length (RL) and root hydraulic conductance per unit of root length (Lpunit) to top soil dryness were investigated. Pigeon pea (Cajanus cajan) and sesbania (Sesbania sesban) were grown in a vertical split-root system. From sixty-six days after sowing, the top soil was dried while the bottom soil was kept wet. Pigeon pea increased LA while maintaining leaf water potential (ΨL) by reducing gs. Increased transpirational demand through canopy development was compensated for by increasing water extraction in the bottom soil. This was achieved by increasing not only RL but also Lpunit. Sesbania kept constant levels of gs, causing a transient reduction of ΨL. ΨL of sesbania was, then, recovered by increasing only RL, but not Lpunit, in the bottom soil while suspending LA extension, suggesting that sesbania regulated only the root area to LA ratio. This study demonstrated a species-specific significance of Lpunit and coordination among Lpunit, RL, gs and LA in exploitation of wet-deeper soils in response to top soil dryness. Reduction of water supply induces top soil dryness, causing a difference in soil water availability between soil layers. To exploit such a heterogeneous resource in soils, plants are known to exhibit various root responses. Morphological and physiological responses of roots in exploitation of heterogeneously distributed soil nutrient have been widely investigated [1-3], and the importance of such root responses in plant growth was demonstrated by many investigators [4-7]. The case in water uptake is, however, more complicated than that in nutrient acquisition since driving force for water uptake is mainly generated by transpiration [8-10], and depending on soil water availability, plants attempt to balance transpiration and water supply [10-12]. To examine the plant capacity in exploitation of such water sources, therefore, the balance between transpiration and water supply must be taken into account rather than focusing only on root factors. Transpiration is a function of two factors; stomatal conductance and leaf area so that either or both of the two factors should determine apparent root water uptake. The potential of root function for water supply is primarily determined by two factors: total root length (or root area) and hydraulic conductance of the roots. Thus, it can be considered that the balance between transpiration and water supply will be achieved by coordination among the four factors. For instance, plants in drying soils tend to reduce stomatal aperture when root water supply is unable to meet the transpirational demand . Plants may also control water relations through modifying the ratio of leaf area to root length [13,14]. It was reported that defoliation of leaves, which decreases the ratio of leaf area to root length, rapidly raised stomatal conductance of sugarcane . Two leguminous species: pigeon pea (Cajanus cajan) and sesbania (Sesbania sesban), are known to be well adapted to semi-arid conditions [15,16], and have been reported to develop similarly deep-rooting systems for growth under water-limited conditions in which soil water availability is limited in deeper soil profiles . A previous study suggested that patterns of water uptake from deeper soils, upon being exposed to the vertical heterogeneity of soil water, differed between the two species, and showed different types of drought avoidance . Besides, it was suggested that the difference in water uptake pattern may have been caused by a difference in the coordination among the shoot and root factors. Thus, in the present study, it was aimed to reveal the different coordination among leaf area, stomatal conductance, root length (or root area) and root hydraulic conductance, between pigeon pea and sesbania when the top soils become dry and the water is available only in the bottom soils. Hence, the same vertical split-root culture as used in the previous study  was also employed in the present study. As the top soil moisture became depleted, root length and root hydraulic conductance of the roots in the bottom soil were measured over time. For the determination of root hydraulic conductance, a high-pressure flow meter was employed because the device will eliminate intervention of osmotic force and air-filled spaces in roots, making it possible to evaluate properly the root hydraulic conductance to water flow caused by hydrostatic force . Stomatal conductance and leaf area were also monitored, and the influence of changes in each parameter on water extraction by the roots in the bottom soil and on leaf water potential was analyzed. Figure 1. 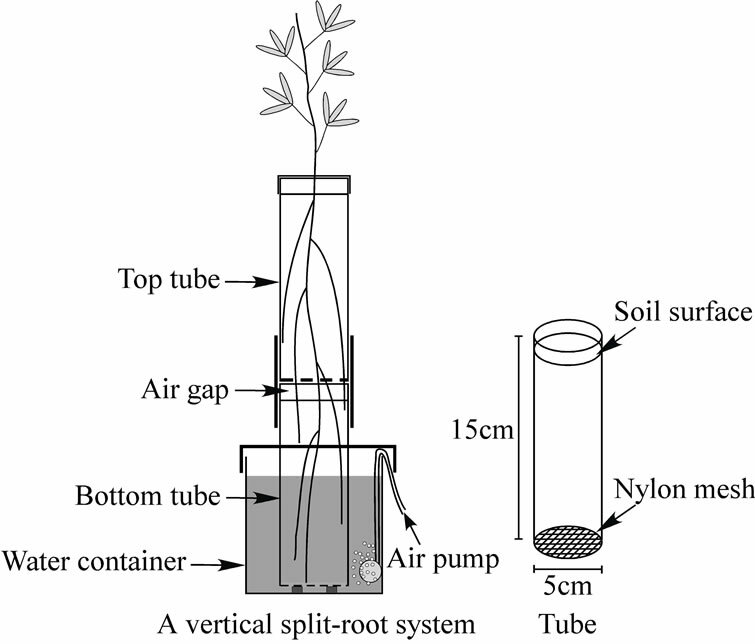 Schematic diagram of a vertical split-root system. Polyvinyl chloride tubes, whose bottom ends were covered with nylon mesh, were filled with loamy sand and joined together. An air gap between the two soils prevented the movement of water except through evaporation. The connected tubes were placed in a container along with water aerated with an air pump. and hence assumed to experience the similar oxygen levels . Water uptake from each pot, leaf area, transpiration rate, stomatal conductance, leaf water potential, root length and root hydraulic conductance were measured on six different dates, with six replications of each, requiring a total of 36 individual plants for each species. All pigeon pea (purchased from Snow Brand Seed Co. Ltd., Sapporo, Japan) and sesbania (provided by the International Centre for Research in Agroforestry: ICRAF or the World Agroforestry Center) plants were grown in a growth chamber (30˚C and 70% relative humidity (RH) in 12 hrs photoperiod with 500 mmol∙m−2∙s−1 light, and 25˚C and 70% RH in 12 hrs dark). Three germinated seeds were sown in the top soil of each system, and the seedlings were thinned to one stand when the third leaf emerged. The soil in the top tube of each system received 80 mL of tap water at two-day intervals. The soil in the bottom tube of each system was kept wet by maintaining the initial volume of water in the container. Sixty-six days after sowing, the top soil of each system was supplied with 150 mL of water. The surface of the top tube was wrapped with plastic sheet and watering to the top tube was then withheld. Twenty-four hours after watering, the volumetric soil water content in the top tube was measured using a soil moisture meter (HydroSense, Campbell Scientific Australia). This measurement determined the initial soil water content in the top tube. The container at the bottom then received 1.0 L of water and the surface of the container was also wrapped with plastic sheet. The plastic sheets on the surfaces of both the top tube and the container prevented all moisture loss other than through transpiration. After 24 hrs, the first measurements of water uptake (Day 1) were made as follows. The volumetric soil water content in the top tube was measured, and the amount of water extracted from the top tube was calculated by subtracting the soil water content from the initial value. The amount of water extracted from the bottom tube was measured by tracing the water surface level in the container. The same measurements of water extraction from each tube were made 72 (Day 3), 120 (Day 5), 168 (Day 7) and 312 (Day 13) hrs after withholding water to the top tube. A fully expanded leaf (the third leaf from the youngest fully expanded leaf) was used for the determinations of parameters. Stomatal conductance (gs) was determined on the abaxial surface of the leaf using a hand-held diffusion porometer (Delta-T AP4, Cambridge, UK), and transpiration rate (T) was calculated from the value of gs, ambient RH, and temperature of the leaf and room. Measurements of gs and T on Day 0 were disturbed by problems with the porometer, so the values of gs and T on Day 0 were removed from the figure. The same leaf used for the determinations of gs and T was cut from the plant and the leaf water potential (ΨL) was determined using a pressure chamber (PMS Instrument Co., Oregon, USA). Hydraulic conductance of roots (Lp) in the bottom soil was determined using a high-pressure flow meter (HPFM) (Dinamax, Inc., Texas; Tyree et al. 1995). The apparatus perfuses pressurized water into a root system and calculates Lp from the linear relation between pressure and water flow. Prior to the Lp measurement, the split-root tubes were removed from the container, and the masking tape seals were removed. Then, the tubes were separated after cutting with a razor blade the roots (the primary root and the lateral roots from the top soil) penetrating from the top to the bottom soils. Immediately after the separation, a stump of the primary root was connected with a tube from the HPFM, and water was applied at a constant pressure of 0.2 MPa into the root for at least 180 seconds. During this period, any change in resistance was carefully monitored to check water leakage. Transient flow measurement was made afterwards. While water in a captive air tank of the HPFM was pressurized at rate of 3.0 kPa∙s−1, the water flow (F) resulting from the pressure was measured every 2.0 seconds. F was plotted versus the applied pressure up to around 0.5 MPa. As illustrated by Tyree et al. (1995) , the curves were not linear for the first 0 - 0.25 MPa but became distinctly linear at more than 0.28 MPa. Thus, the slope of the regression line at more than 0.28 MPa was computed as measured Lp. The length of root systems used for the Lp measurement was determined by the method described below, and the root hydraulic conductance per unit of root length (Lpunit) was calculated by dividing the measured Lp by the root length (RL). Since some other lateral roots penetrated from the top soils into the bottoms soils, the root hydraulic conductance of whole roots (Lpwhole) in the bottom soils was estimated by multiplying the Lpunit by the length of whole roots in the bottom soils. The shoots were cut at their bases. The leaves were then removed from the stems and spread on a transparent sheet, without overlap. Digitized images were taken using a scanner with a resolution of 300 dpi and an output format of 256 grey-scales. Leaf areas (LA) were calculated from the images using the NIH Image version 1.60 image-analysis software. The leaves and stems were dried at 80˚C for 48 hours and the dry matter weights (DW) were measured. After sampling the shoot parts, the roots were obtained from the bottom tube by removing the soils on a sieve (212 μm mesh). Each root sample was then spread on a transparent sheet, without overlap. The digitized images were produced using the methods described above. RL was determined by diameter class, using a macro-program developed by Kimura et al. (1999)  on the NIH Image version 1.60 software. Root area (RA) was estimated from the root length by diameter, assuming that the roots for a given diameter were cylindrical. The ratio of RA to LA (RA/LA ratio) was then calculated. The data were analyzed using analysis of variance (ANOVA). The mean separation between different sampling dates was then determined using Fisher’s protected least-significant difference method (PLSD) for all analyses. The changes over time in soil water content in the top soil and the cumulative water extraction from the bottom soil during the period that water was withheld are shown in Figure 2. Both pigeon pea and sesbania continued to extract water from the top soil after withholding water to the top soil, and the soil water content declined to 8% (v∙v−1) at Day 1 in pigeon pea and Day 3 in sesbania. This level of soil water content corresponds to approximately −0.62 MPa, according to the soil water retention curve calculated previously, indicating that little amount of water could be supplied from the top soil. Indeed, water extraction from the top soil by both the species ceased after the soil water contents reached that level. In pigeon pea, cumulative water extraction from the bottom soil increased at Day 1 and subsequently remained at this level until Day 3. Then it significantly increased at Day 5 and again remained at this level until Day 7. By Day 13, it significantly increased and became approximately 1.5 kg on average. In sesbania, water extraction from the bottom soil increased at Day 1. After that, it remained at this level until Day 5 and the significant increase was detected at Day 7. By Day 13, it significantly increased and became 1.9 kg on average. Figure 3 shows the changes over time in DW of the leaves and stems during the period that water was withheld. Figure 2. 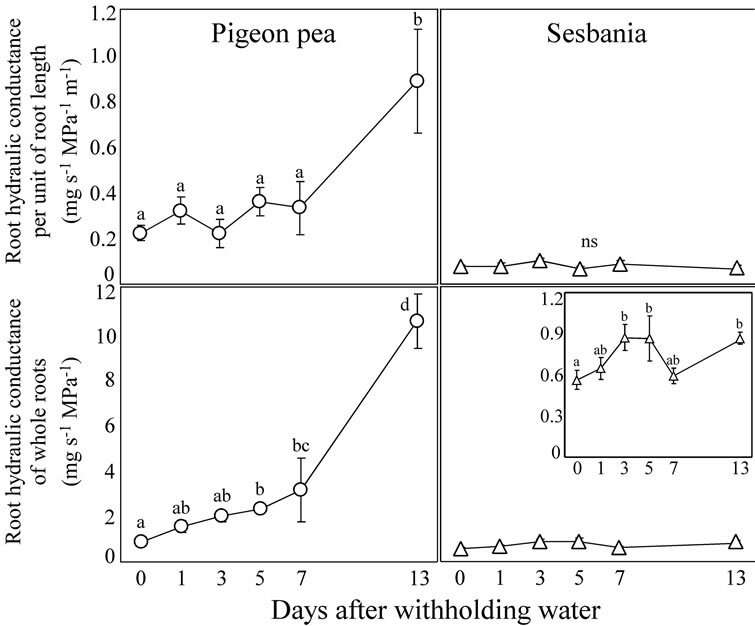 Changes over time in soil water content (v∙v−1) in the top soil and the cumulative water extraction from the bottom soil of pigeon pea and sesbania during the period that water was withheld. Each data point represents the mean ± standard error (n = 6). Different lower case letters indicate significant differences between values (Fisher’s PLSD, P = 0.05). Figure 3. Changes over time in dry matter weight (DW) of leaves and stems during the period that water was withheld. Each data point represents the mean ± standard error (n = 6). Different lower case letters indicate significant differences between values (Fisher’s PLSD, P = 0.05). became 2.0 times and 2.6 times higher on average at Day 13 in the leaves and stems, respectively. In contrast, in sesbania, DW was increased over time only in the stems, and there was no significant increase in DW of the leaves during the period. A significant increase in DW of the stems was detected at Day 13, and it became 1.9 times higher on average at Day 13compared with Day 0. Figure 4 shows the changes over time in RL and RA in the bottom soils, LA and RA/LA ratio during the period that water was withheld. RL and RA in pigeon pea increased over time. Significant difference from Day 0 was detected at Day 7 in both the parameters, and it became 1.9 and 2.2 times higher on average at Day 13 in RL and RA, respectively. RL and RA in sesbania also increased over time, and they became 1.8 and 2.1 times higher, respectively, on average at Day 13 compared with Day 0. These results indicate that as the top soil is desiccated, both pigeon pea and sesbania tend to develop more roots in the bottom soil. LA in pigeon pea steadily increased throughout the period, and it became 1.5 times higher on average at Day 13 compared with Day 0. In sesbania, there was no significant increase in LA throughout the period that water was withheld. Figure 4. Changes over time in length (RL) and area (RA) of roots in the bottom soil, leaf area (LA) and ratio of root area to leaf area (RA/LA ratio) of pigeon pea and sesbania during the period that water was withheld. Each data point represents the mean ± standard error (n = 6). Different lower case letters indicate significant differences between values (Fisher’s PLSD, P = 0.05). always higher than that of pigeon pea throughout the period that water was withheld. Figure 5 shows the changes over time in Lpunit and Lpwhole in the bottom soils during the period that water was withheld. Figure 5. Changes over time in root hydraulic conductance per unit of root length (Lpunit) and root hydraulic conductance of the whole roots (Lpwhole) in the bottom soil of pigeon pea and sesbania during the period that water was withheld. A magnification of sesbania Lpwhole is also presented in the inset. Each data point represents the mean ± standard error (n = 6). Different lower case letters indicate significant differences between values (Fisher’s PLSD, P = 0.05). Lpwhole in pigeon pea significantly increased until Day 7. Since a statistically significant increase of Lpunit was not detected during this period, the increase of Lpwhole until Day 7 should have been caused mostly by the increase of root length. Lpwhole in pigeon pea then drastically increased at Day 13, an increase that should have been due to the increase of Lpunit because a significant increase of root length was not observed between Day 7 and Day 13. Lpwhole in sesbania significantly increased at Day 3 and remained at this level until Day 13 except for Day 7. Since Lpunit in sesbania was constant throughout the period that water was withheld, this increase in Lpwhole should have been caused by the increase in root length. The changes over time in gs and T during the period that water was withheld are shown in Figure 6. After the top soil was desiccated at Day 1, gs in pigeon pea drastically declined by Day 3 and remained at the same level until Day 13 when the value was one-fifth of that at Day 1. It seems likely that pigeon pea reduces stomatal aperture in response to top soil desiccation. Although the transpirational demand of a single leaf declined as a result of the reduced stomatal aperture, that of the whole plant was partly recovered by the increase of LA (Figure 4). Figure 6. 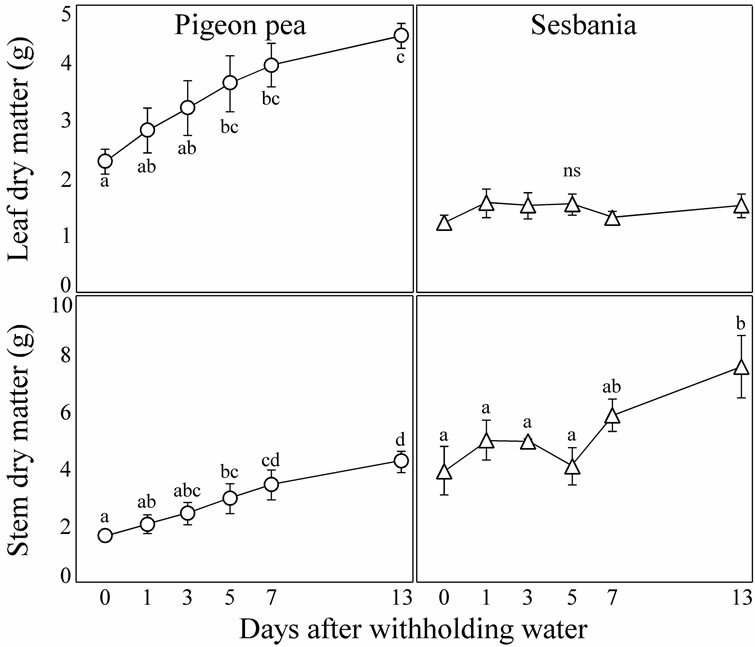 Changes over time in stomatal conductance (gs) and transpiration rate (T) of pigeon pea and sesbania during the period that water was withheld. A fully expanded leaf (the 3rd leaf from the youngest fully expanded leaf) was used for the measurements. Each data point represents the mean ± standard error (n = 6). Different lower case letters indicate significant differences between values (Fisher’s PLSD, P = 0.05). out the period even after the top soil was desiccated at Day 3. Another experiment, in which sesbania plants were subjected to wet-and dry-soil treatments, also showed that gs was not reduced by the dry-soil treatment, remaining at almost the same level as that from the wet-soil treatment (data not shown). These results imply that stomata in sesbania are insensitive to top soil desiccation. Because the stomatal aperture and LA remained at the same level throughout the period in sesbania (Figure 4), the transpirational demand also remained constant. T of each species exhibited the same trend as gs of each species since the temperature and RH was constant in the chamber throughout the experiment. Figure 7 shows the changes over time in ΨL during the period that water was withheld. In pigeon pea, ΨL was almost stable throughout the period although there was a slight decline between Day 7 and Day 13. The maintenance of the high level ΨL despite top soil desiccation in pigeon pea must have been achieved by two processes: the reduction of transpirational water loss as a result of stomatal closure (Figure 6) and the increase of water supply as a result of the increases in RL (RA) and Lpunit (Figures 4 and 5). Figure 7. 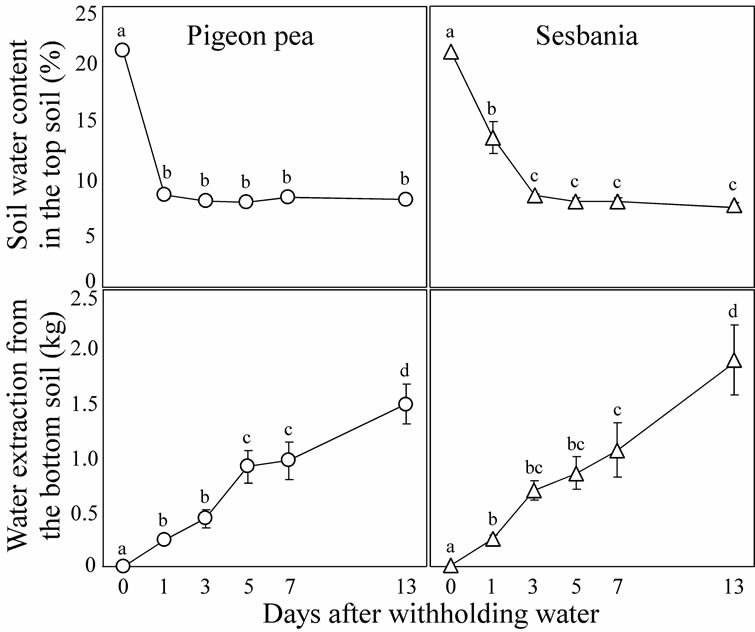 Changes over time in leaf water potential (ΨL) of pigeon pea and sesbania during the period that water was withheld. A fully expanded leaf (the 3rd leaf from the youngest fully expanded leaf) was used for the measurements. Each data point represents the mean ± standard error (n = 6). Different lower case letters indicate significant differences between values (Fisher’s PLSD, P = 0.05). cated. However, the trend reversed at Day 5 and, at Day 13, ΨL recovered almost to the same level as that of Day 0. In sesbania, stomata exhibited little response to top soil desiccation so that the recovery of ΨL cannot be explained by the reduction of stomatal aperture (Figure 6) but by the increase of water supply as a result of the increase of RL (RA) (Figure 4). Two leguminous species, pigeon pea and sesbania, extracted a similar amount of water from the wet-bottom soils after the top soils became dried (Figure 2). However, each species utilized the extracted water in a distinctly different manner. Pigeon pea reduced gs in response to the top soil dryness (Figure 6), making it possible to maintain ΨL at the high level throughout the period that water was withheld (Figure 7). While an excessive water loss was suppressed by the reduction of gs, the extracted water from the bottom soil was used for the increase of shoot dry weight (Figure 3) and expansion of canopy area (Figure 4). Thus, pigeon pea regulated only gs to control water loss, and the limitation of LA is not an option for this purpose. In sesbania, gs was kept high throughout the period that water was withheld (Figure 6), even while ΨL temporarily dropped in the first three days (Figure 7). Then, the extracted water was continuously lost through stomatal aperture. However, the weight and area of leaves in sesbania, in contrast to those in pigeon pea, were not increased but maintained at the same level, and only the weight of stems was increased (Figures 3 and 4). It seems likely, therefore, that sesbania ceases canopy area expansion to control water loss instead of regulating gs, and photosynthates assimilated during the period with the open stomata is allocated not to the leaves but to the stems and roots. The potential of root function for water uptake is primarily determined by RL (or RA) and Lpunit. Thus, plants need to extend water uptake by an increase with length (or area) or, probably, Lpunit of roots in wet soil zones under limited-water conditions. An importance of RL (or RA) increment in water uptake under limited-water conditions has been well recognized previously. For instance, Tsuji et al. (2005)  demonstrated that the complete withdrawal of irrigation induced sorghum plants to develop more roots in the deeper soils, enabling the plants to extract more water from those layers. In the present study, also, the increase of RL (or RA) in the wet bottom soils is one of the contributing factors to improve water uptake in the two species (Figure 4). However, few studies have been conducted as to how Lpunit of roots in wet soil zones (mostly deeper soil layers) contributes to water uptake in response to soil dryness in the other zones (mostly shallow soil layers). Previously, an individual root or whole root system was evenly exposed to moisture deficiency to investigate responses of Lp [22-24]. In such studies, Lpunit considerably decreased as a result of suberin deposit in the root tissues. North and Nobel (2000)  reported that a single root of a desert succulent exposed to “horizontally” distributed soil water reduced Lpunit in a dry region due to lignification and suberization. However, the increase of Lpunit in the wet region was not detected. In addition, Jackson et al. (2000)  stated that reduction in water flow in deep roots of Juniperus ashei can be attributed to reduction in Lpunit caused by cavitation. However, the cavitation-induced changes in Lpunit should be analyzed separately from the root hydraulic conductance to water flow caused by hydrostatic force. In contrast, the present study clearly demonstrated that pigeon pea increased water uptake by an increase with Lpunit in the wet-bottom soils in response to the top soil dryness (Figures 2 and 5). It is evident from the present study that both the shoot and root factors have significant impacts on water uptake under limited-water conditions. As suggested by several researchers, plants attempt to balance transpiration and water supply for water uptake depending on soil water availability [10,11], and the balance should be achieved by coordination among shoot (LA and gs) and root (RL or RA and Lp) factors. In the present study, such coordination was found in both the species, but its trend was greatly different. In pigeon pea, as the top soil became dried, stomatal closure prevented a drop in ΨL (Figures 6 and 7). Despite the reduction of stomatal aperture, pigeon pea continuously extracted water from the bottom soil (Figure 2). The major force of the continuous water extraction was the steady increase of canopy area throughout the period that water was withheld (Figure 4). In accordance with the rise in water demand developed by the LA expansion, Lpwhole in the bottom soil also increased (Figure 5). This increase of Lpwhole was, then, achieved by the increase of both RL and Lpunit (Figures 4 and 5). The dynamic nature of Lpunit responsive to partial soil dryness is advantageous for pigeon pea to quickly increase Lpwhole when RL (or RA) increment is insufficient to meet with water demand from the shoot. Otherwise, ΨL should have been lowered, causing physiological disturbances in the shoot. In sesbania, RA/LA ratio was higher than that of pigeon pea (Figure 4), indicating that sesbania was potentially more effective in water extraction than pigeon pea because an increasing proportion of RA to LA is known to be advantageous to achieve larger stomatal aperture and preferable water relations [13,14]. 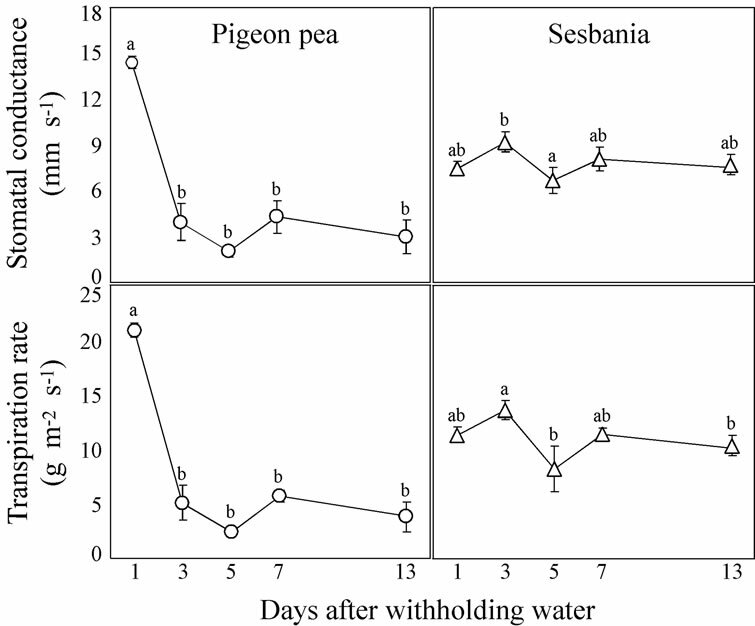 However, ΨL in sesbania temporarily dropped in the first three days of topsoil drying unlike pigeon pea (Figure 7). This was due to the unresponsive behavior of stomata, remaining open, to the lowered ΨL (Figure 6) as well as the low Lpwhole (Figure 5). The dropped ΨL reascended at the fifth day after with holding water (Figure 7) with theslow increase of Lpwhole (Figure 5) rather than lowering gs (Figure 6). The Lpwhole increase was, then, achieved only by the increase of RL (Figure 4) and the alteration of Lpunit was not involved in the process (Figure 5). We reported a species-specific coordination of shoot and root parameters for water uptake from the wet-bottom soils in response to the top soil dryness. There was a common adaptive trend that water stressed plants tend to increase RA/LA ratio. However, pigeon pea that possesses a dynamic nature of not only gs but also Lpunit showed “positive adaptation” in which the growth of both canopy and stems was enhanced at the same time even under the limited-water environment. By contrast, sesbania exhibited “negative adaptation”, in which the growth was limited to the stems, a storage organ, at the expense of canopy growth, a photosynthetic organ, due to a stagnant nature of both gs and Lpunit. We thank Y. Kato for the root length measurements. P. J. Kramer and J. S. Boyer, “Water Relations of Plants and Soils,” Academic Press, San Diego, 1995. W. Larcher, “Physiological Plant Ecology,” Springer, Berlin, 2001. A. Fitter and R. Hay, “Environmental Physiology of Plants,” Academic Press, San Diego, 2002. M. Mencuccini and J. Comstock, “Variability in Hydraulic Architecture and Gas Exchange of Common Bean (Phaseolus vulgaris) Cultivars under Well-Watered Conditions: Interactions with Leaf Size,” Functional Plant Biology, Vol. 26, No. 2, 1999, pp. 115-124. DW, weight of dry matter; HPFM, high-pressure flow meter; LA, leaf area; ΨL, leaf water potential; RA, root area; RH, relative humidity; Lp, root hydraulic conductance; Lpwhole, root hydraulic conductance of whole roots; Lpunit, root hydraulic conductance per unit of root length; RL, root length; gs, stomatal conductance; T, transpiretion rate; F, water flow.